Just for clarity in this review, the GR 9000 from Grays is only available with the Dynabow shaft, as per our review of the complete Grays range the GR hockey sticks have only a few options to make it easier to review each stick individually. 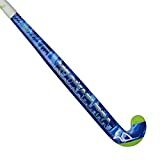 At the top of the worlds longest established and most seen hockey stick brands lies a range of 4 super high specification sticks, they are called the Grays GR hockey sticks. This review concentrates on the GR9000 which is the second in the list and only in my opinion second because the world demands ‘low’ bow positions to become the number one hockey stick, the GR9000 is definitely one of the best hockey sticks on the market. Not low, not high, the Dynabow shaft on the GR 9000 is probably my favourite Grays shaft profile. The big 24.75mm (flirting with the international regulations) curve sits perfectly balanced at 250mm up from the heel and is just part of the long shape to the whole GR9000. Because the balance point of this stick is low it has a great feeling of helping keep the head low down behind the ball and a manoeuvrability to it that allows your arms and hands to work overtime with confidence the stick will stay exactly where you want it. Noticeable about the Grays GR range and the 9000 in particular is how the sticks feel on the ball. Driven by carbon most of us mere mortals get use to the crisp ping of carbon fibre hitting ball. When you come back to something like the GR9000 you are forced to review how great it is to actually have a little softness in your touch. I’m sure the Grays marketing will tell you this is down to the fabulous resin used to build the stick which is littered with Graphene fibres. To me it doesn’t matter what does it, the noticeable softness on the ball makes Grays GR hockey sticks more playable with than many other top end sticks on the market. Some get put off by any talk of softness, those people don’t understand the benefit of ball control that the combination of feel and this great Dynabow shaft shape can give to an active forward motion style midfielder or attacker. These people, perhaps you, will benefit their team more by taking the ball in tricky positions, turning, running and creating goals rather than smashing the living daylights out of balls to no one upfield. There is little point re-listing all the top end Grays feature added to the GR 9000, this is truly a high end stick and for the very high price tag you would expect it. Any Grays stick with the PP Enhanced zone on the reverse edge wins extra commendation though, the toughened area at the bottom of the reverse side of the Grays GR9000 is one of the best features to review. Personally I think Grays do a much better job at increasing the reverse side hitting sweetspot than many others, including adidas’s reinforce reverse edge. Let’s face it, if you are looking to review the Grays GR 9000 seriously before buying one you are already in a place where you are looking at the top of the range hockeysticks. The biggest thing I can tell you to re-affirm your decision to buy the Grays GR 9000 is that it is a truly awesome hockey stick. In 2015 Grays have re-rounded the shaft down where your right hand grips (you know, just under the grip, why don’t they just make their grips longer?) because this was quite uncomfortable in the past as the octagon handle, especially for dribbling. This has made a great improvement and the GR9000 is back in the ultimate list for running, dribbling players everywhere.